To boost business around Printed Intelligence - 3rd PrintoCent InnoFest was a success!! June 15th, 2016: Oulu, Finland —Open innovation at its best! The third annual PrintoCent InnoFest offered the most comprehensive facilitation for innovators from a great variety of disciplines. Similarly, to the two previous events, InnoFest formed the innovation stream of the startup event Midnight Pitch Fest 2016. This international 2-day fest brought together both startups as well as more established companies, investors, innovators, speakers and students. 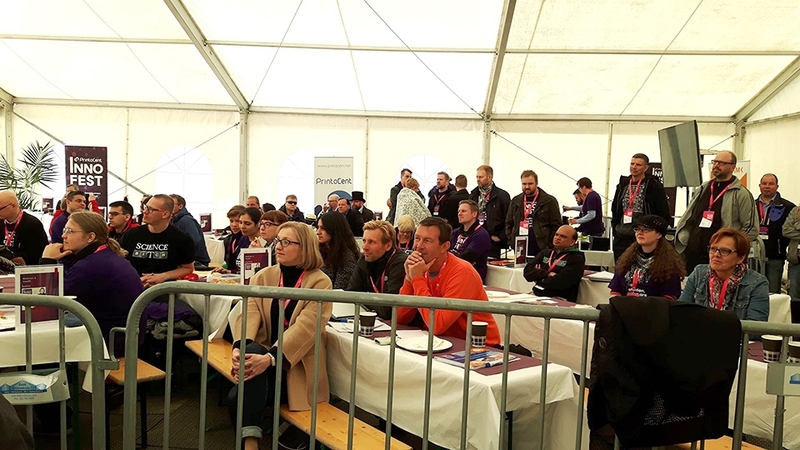 These joint events took place at the Nallikari beach, Oulu, Finland June 9-10 and the PrintoCent InnoFest was part of the Printed Superweek with events like the PRINSE’16 industrial seminar. During the two days there were 25 competing teams with printed intelligence and electronics related ideas ranging from frisbee disc enhancements to improving the health care systems in the developing countries. The Grand Prize was awarded to the team Cartoon Keyboard with Juhani Kemppainen, Sari Närhi and Tapio Ritvonen. They came up with an idea to produce a cost-efficient and a handy small keyboard as an attachment to devices with limited input options like activity monitors etc. The Biggest Commercial potential award was received by Matti Koivu, Elina Takaluoma and Jarno Vehmas with their idea on huge lightweight outdoor displays for sport arenas and similar places. The Wildest Idea was rewarded to the team Valgee with Ari Riihimaa, Seppo Alanärä and Antti Oikarinen for their unique idea to produce fresh air and proteins with indoor mini-garden with an alga based ecosystem. The Attitude Prize went to the team OxyWear with Lucinda Senra and Jukka-Pekka Nyman for their idea to ensure hikers’ safety and health when climbing and needing to worry about mountain sickness. The Industry Favourite was awarded to Juho Saavalainen and his LightWood idea for his original idea to combine plywood and printed electronics. PrintoCent InnoFest thanks all the active participants and is already planning for the next event in June 2017!